Here is the Daily Dose for Thursday, April 14, 2016. If you went to New York City in the 90s you know that it was a great place to find a deal. You could shop all over the city and find awesome buys everywhere you looked. The most impressive of the buys that you could find was not in any store, and not in the latest boutique, but it was in Times Square. Only in Times Square could you find the briefcase guy. Who was the briefcase guy you ask? The briefcase guy was the group of guys wandering Times Square selling expensive watched out of his briefcase. 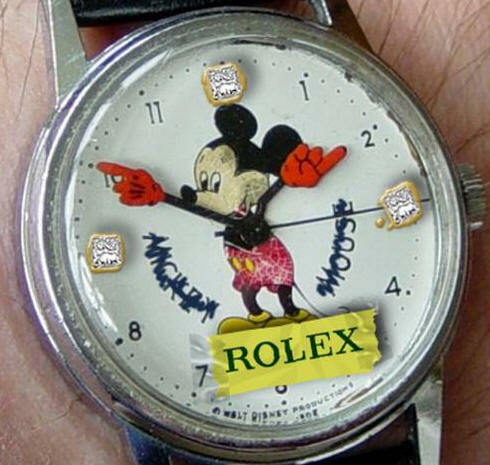 Want a Rolex? See the briefcase guy! Need a Omega? See the briefcase guy? Looking for a Tag Heuer? The briefcase guy has got you back. You can have any of them for just $50. Yes, for $50 you could have a $5,000 watch from the briefcase guy. Interesting thing was, the briefcase guy never seemed to be selling watches to people who were actually from New York. He only seemed to be selling them to tourists. You see he would ask people who were staring at buildings or looking a little lost where they were from. When they said anywhere but New York, he would be nice, polite, point them towards something nice, then offer them a deal. He would open his briefcase and tell them he had a special supply of watches that he “came across” and he’d be happy to sell them one. One after another, tourist after tourist, they got a great deal on a Rolex to take back to Omaha, Richmond, St. Louis or wherever else they were from. Problem is, it wasn’t a Rolex and not worth $50, let alone $5,000. Like many others, the briefcase man, needs people who are not discerning. He needs people who don’t know any better, and aren’t playing close attention. He needs people who are not going to look closely, not going to examine and not going to question. That leads them to making a bad decision. By contrast, people who are discerning, who think things through, who are wise and use knowledge never even stop to talk to the briefcase man. It’s just not worth their time. In life, you can waste a lot of time looking in the wrong places for the right things. There has to be a time when you start using wisdom and discernment so you can stop wasting time. So true…. Well said Rev! We often forget that a good deal… if it looks too good to be true… it probably is… Same with the church. Just because it sounds good, doesn’t mean that it is biblical or true.